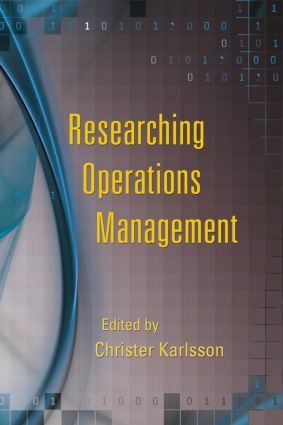 Researching Operations Management fills the growing need for a comprehensive textbook and reference on doing quality research in the field of Operations Management (OM). It addresses the particular problem—especially for advanced students and beginning researchers—that many academic departments specialize in just one or a few approaches to research. As a result many students and researchers are not exposed to the breadth of possible research approaches in OM. Providing a concise overview of each of the most important research approaches in the field, the book enables researchers and students to understand and practice these methods, thus giving them a platform for choosing appropriate and complementary approaches to their research. With contributions from an international group of leading thinkers in the OM research field, the book covers those methods frequently used in studies of OM as well as adjacent applied management areas such as management of innovation and R&D, logistics, and supply chain management. Included are chapters on surveys, case studies, action research, longitudinal field studies, and models and simulations together with chapters on planning, positioning, assessing, and publishing research. In addition, the contributors also consider ethical and cultural issues in researching operations management.